Ways & Means Chair Paul Ryan (R-WI) is pushing to bring Fast Track legislation for the digital-rights-impairing Trans-Pacific Partnership (TPP) to a vote in the House. Please call your representative now at 888-804-8311 and urge them to vote NO on Fast Track. Representative Ryan’s Fast Track bill has already passed in the Senate, and if approved by the House, would allow secretive trade deals like the Trans-Pacific Partnership (TPP) to be rushed through Congress with dangerous consequences for online innovation and user rights. Despite being under negotiation for years now, the American public has been barred from reviewing what TPP negotiators have been proposing in our names. Meanwhile, representatives of well-connected industry groups like the Motion Picture Association of America, AT&T and Verizon have had special “cleared advisor” status which provides them with privileged access to the TPP texts and TPP negotiators. The TPP is bad for American workers. As written, the TPP would force working Americans to compete with sweatshop workers overseas in countries like Vietnam, where the minimum wage is less than 60 cents an hour, and in Malaysia, where up to a third of workers in the countries export-oriented electronics industry are forced laborers — a euphemism for modern-day slaves. 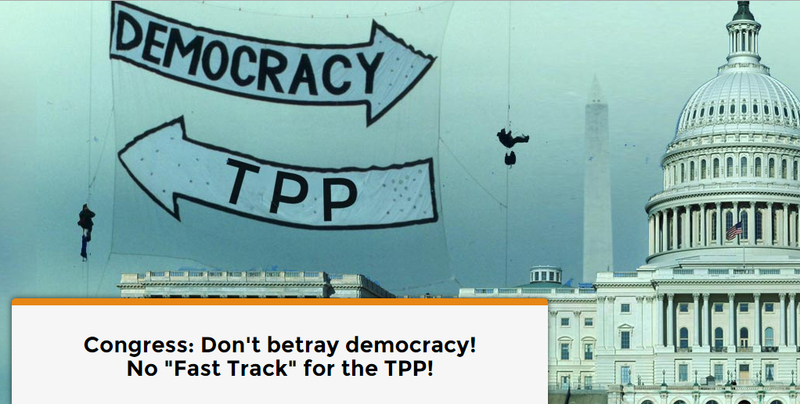 TAKE ACTION NOW: please call your Congressperson at 888-804-8311 and urge them to vote NO on Fast Track. The good news is that, together, we can win this fight. Literally thousands of organizations — representing the environmental, family farm, civil rights, consumer, labor, LGBT, student and other movements — have united with the Internet freedom movement in saying NO to Fast Track. We need your voice, too. For local information about the TPP, check out Congressman Raul Grijalva’s anti-TPP event on June 6 at the IBEW Hall. Obama when he leaves office wants to be on the board of directors of multi national corporations that will pay him a million dollars each or more. They like TPP! Not bad for muslim communist born in kenya! How many of you think he will join jimmy carter at habitat for humanity? I have a problem with this issue. I am and always was against NAFTA and the other free trade agreements that so badly affected US workers and the environments of other countries, effectively off-shoring both jobs and our waste. I am a progressive, probably as good a progressive as anyone in the Progressive Caucus. I have told him and firmly believe that Congressman Grijalva is a hero. But time after time when Pres. Obama seemed to be giving away the farm in negotiations with the Republicans, within anywhere from minutes to days after signing legislation the Republicans discovered that they had been snookered by that fabulous Obama smile. What WE progressives thought was a giveaway to the right turned out to be more advantagious for us than we imagined. This is the same president who in secret negotiations with the Chinese came up with a deal on global warming that no one could have thought possible. This is the same president who got us health care. The same president who has come out ahead on every deal that he has ever made for us. Think about that. I find myself thinking is it really possible that he would abandon us at the end? Or that he could be stupid enough to be manipulated by Wall Street? This agreement, whatever can be seen of it, is a) still a work in progress and b) not at all visible even to those allowed to see what they can of it. So how can WE progressives be so sure that it is bad for the people, our people? Furthermore our President is undoubtedly correct when he says that if we don’t write it, the other side will. The other side that he mentions is the Chinese, but the other Other side is the Republicans, that is the other side that I am worried about. And if we let them write it we will surely get less worker protections, less environmental protections, less oversight, and less food safety protections than he would negotiate for us. Let us also be completely honest — NO President will EVER be able to negotiate any trade agreements in a transparent, public manner. EVER! Negotiations on anything like this are always secret, if for no other reason than that they are necessarily messy. They involve threats and bluffs, and crazy poker player moves that simply cannot be done in public. Therefore they won’t. Ever. Whatever is thought about this agreement, as distasteful as any agreement for free trade is — which by the way I detest because I think we should be charging tariffs to level the playing field and to punish countries for produci goods in a toxic way — whatever progressives Think this agreement is, I think we need to give our President the right to negotiate FOR US, the people, on our behalf, because I trust that he will get the best deal possible and because as much as I hate free trade agreements I think we will have them forced on us by globalization no matter what. We are caught between the forces of that global tide and the hard place of isolation that we can never go back to. So we better get the best negotiator out there working his magic. And yes I think we have to HOPE that he can get us a decent deal in a crappy world. It will not be perfect, there are too many other countries with too many other interests. I wish we didn’t have to do this. But I have come to the conclusion that we can’t opt out. I do trust President Obama to try his best to get us the best deal he can. Also I am unhappy with those who resort to name-calling toward a man who has tried his best for us every chance he could get. It is unbecoming and unworthy. The man has done a good job under extraordinarily bad circumstances, he deserves respect even if you disagree. That’s what I think. I won’t respond to anyone else’s reply or comments, feel free to express yourselves. I think this is an area worthy of serious discussion, but I just wanted to tell you what I am feeling and why. I have honestly been struggling with this over many weeks and wanted to express a viewpoint that I don’t think has come up much, if at all. If you don’t agree, that’s fine, that’s what democracy is all about. I agree . Why is Obama doing this? He could easily shut up the TPP opponents if he would make the deal transparent. HE is the person who has imposed the secrecy. It makes no sense. Also, for the record, none of the “free” trade deals have been good for US workers. We need fair trade deals– not free trade. Interesting take TS. I haven’t looked at it that way. Although I have to say that I find it extremely difficult these days to trust what any politician does when money is concerned.